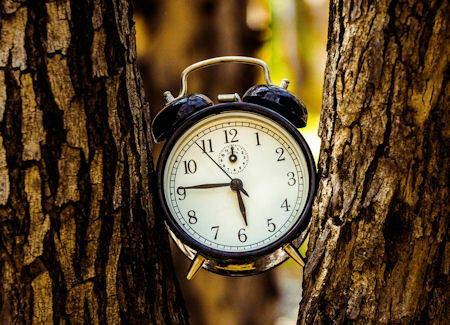 Throughout our lives the importance of being on time is stressed - at home, at school, at work. And we learn that, not only is it considered impolite to be late, it can cost us – as anyone who has been kept back after school or had a stern talking to by their boss, or lost out on a job because they turned up late for the interview or were locked out of a concert or other event because they arrived after start time, will know. So the idea that a bride being “fashionably late” for her wedding is a traditional must do totally goes against other community norms. And the fashionably part of it makes no sense at all, given that the origin of the term related to the time at which an event started, events such as meals and parties starting later if you were part of the “fashionable” set, or the upper echelon of society, compared with the rest of us. For example, the fashionable hour for dinner consistently slid later and later between 1200 and 1900, to the extent that in Britain it is now a well-known class marker in speech (working-class people have their dinner at midday, as mediaeval people did, while the middle and upper classes dine in the evening). The term "fashionably late" actually applies only to “arriving after the arranged time to a meeting or event that does not require strict punctuality, especially so as to give the appearance of nonchalance or having been preoccupied by other social engagements.” For everything else arriving after the designated start time is just “rude late”. So when someone was described as arriving "fashionably late", the implication was that they were just full of themselves and attention-seeking! When you said someone was ""fashionably late", you were being sarcastic, but somewhere along the line (and not that long ago) the term lost its sarcastic tone. So when guests told one another that the bride was "fashionably late" at one of the Married at First Sight weddings this week, they were being deadly serious. The widespread belief that a bride should be late to her own wedding predates this being described as fashionably late by a very long time. I have my own theory about that. And it is related to the fact that the wedding was the public event at which the bride was transferred from the care and control of her father to care and control of her husband. She could do virtually nothing without the permission of the male who legally “owned” her, so the moment when she was in the process of being transferred from one to the other was the one moment when she could have a brief moment of control – by being late to walk down the aisle. Curiously, wives only became, legally, their own complete person in the 1980s. And it was in the 1980s that the term "fashionably late" moved into common usage - minus the sarcasm. If you take a practical view of what you’re paying for your wedding, you’re paying for certain services delivered within a contracted period of time. So you’ve booked your photographer for a certain number of hours, your ceremony venue for a certain period of time, your reception for a certain number of hours, and your drinks package for a certain number of hours, all of which will have a contracted start and end time. If you are late starting, you lose that time, and the services related to that period of time. You don’t get a discount or refund for being late! In calculating how much to charge you, the vendor will have worked out what quantity they will deliver as well as the spread of time over which they will deliver it. For example, for a drinks package, the venue will have worked out how much booze and other beverages will be dispensed over that time, and priced the package accordingly. Imagine you’ve booked a 4 hour drinks package, but you turn up late, so serving of drinks has to be compressed into a 3 hour window. Your guests are going to drink 25% less, which means that you have paid 25% more per drink. Some vendors might have a late-start fee. That's an extra expense that you probably did not budget for. In some situations you might face a fine if you go over the end time. For example, Brisbane City Council fines wedding styling companies if the chairs and other decor items are not set up and cleared away within the 2-hour period of the site booking. If your vendor is fined because of your lateness, they will likely bill you for that. Being late can cost you financially, but there is also another type of cost – lost opportunity cost. What you missed out on as a result. If you are running late, your photographer may have to skip taking certain photos, and may miss emotional interactions with guests because you are being rushed off to the formal photos. Your ceremony might have to be cut short in order for your celebrant to meet other obligations. Some of your chosen music may not be played during the reception, guests would have less time for dancing, speeches might be cut short, and the food might be cold or overcooked because of a delayed start to the meal. Net result: your guests might not be in the best of moods after being forced to sit and wait and wait for you to arrive and the ceremony to start, and then being rushed through everything that follows. What could possibly be “fashionable” about all of that?